It is with fond memories that I wrap up my Alaskan Cruise series and tell you about our last port of call: Victoria, BC. Our last shore excursion was a visit to the world-renowned Butchart Gardens. Can I be honest here? 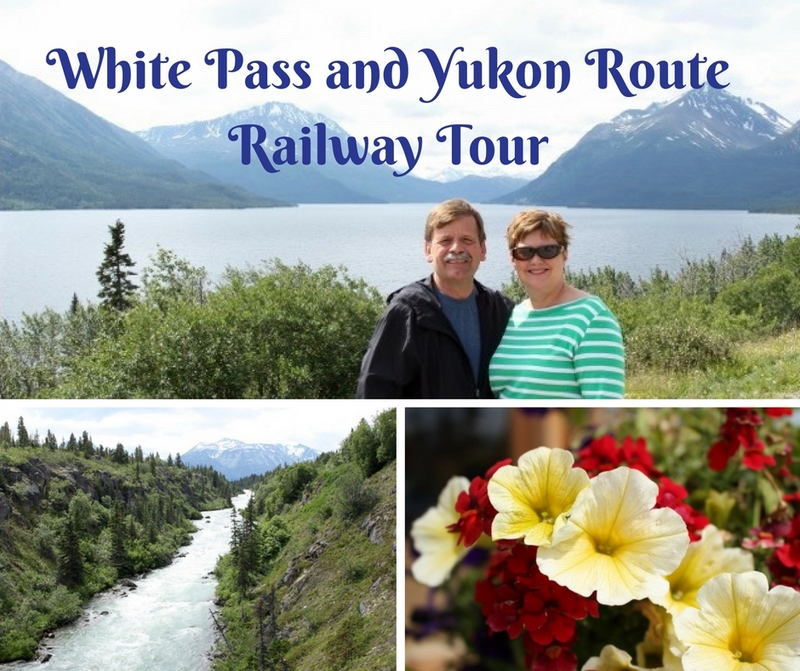 We booked the Alaskan cruise to get out of the Texas summer heat and to see mountains and glaciers and bears and whales and by day seven of the cruise, we had seen what we came to see. To make the tour, we’d have to get on a bus at 6:00 in the evening for a 45-minute ride to the Gardens. After the tour, we would get back to the ship about 11:00, just in time to grab a few hours sleep before we had to disembark at 7 am and prepare for a long day getting home. I had seen gardens before. My hometown of Houston has great gardens. I had visited gardens in many other cities. Did I really need to see one more garden? I was ready to just relax on the ship, have a cocktail, a nice dinner and then turn in early. But since the excursion was already PAID FOR, I decided to go. And I am SO GLAD I did. You see, Butchart Gardens are truly special and are like nothing I have ever seen! 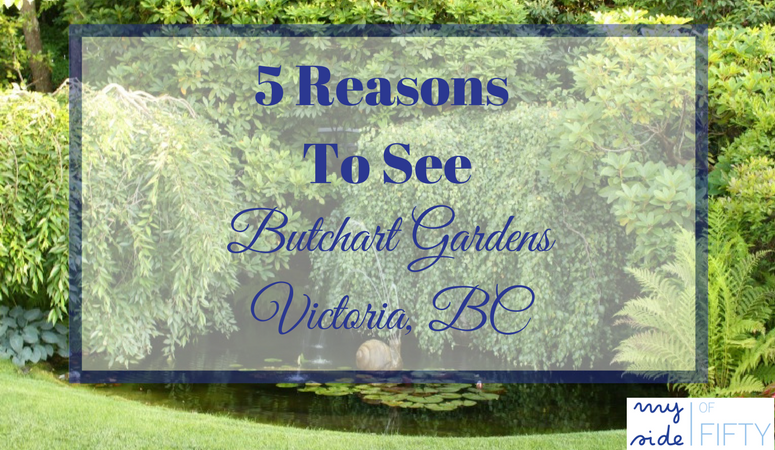 Here are the 5 Best Reasons To Visit Beautiful Butchart Gardens in Victoria, BC. The motor coach that took us from the ship to Butchart Gardens came with the most wonderful tour guide. In addition to showing us the sites around GORGEOUS Victoria (note: must come back here when I have more time), he told us why Butchart Gardens, established in 1904, was a Canadian national treasure and a designated National Historic Site of Canada. Butchart Gardens were the creation of Jennie Butchart, who had the vision of beautifying an old limestone quarry that was part of her husband Robert’s cement plant. When you see pictures of what the gardens USED to be, you quickly realize that Jennie Butchart was an extraordinary visionary. 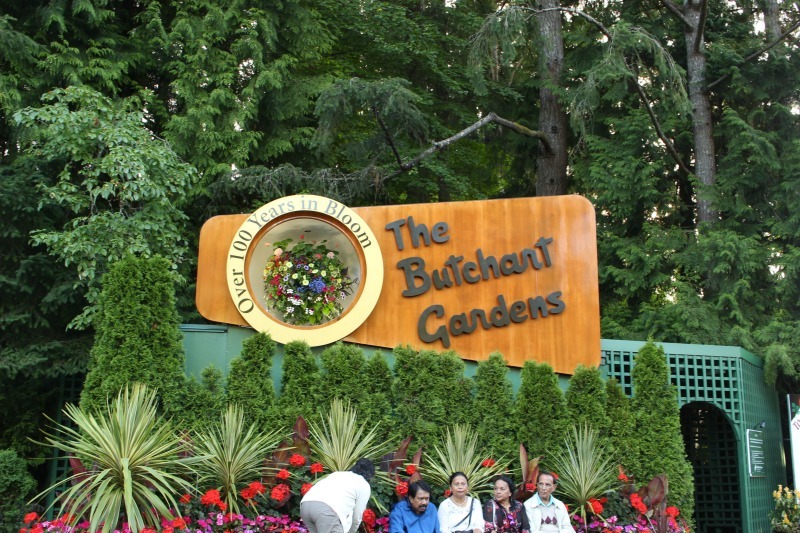 If you are a person who has to see and be seen where EVERYBODY IS GOING, Butchart Gardens is the place for you. It is visited by over million visitors annually. 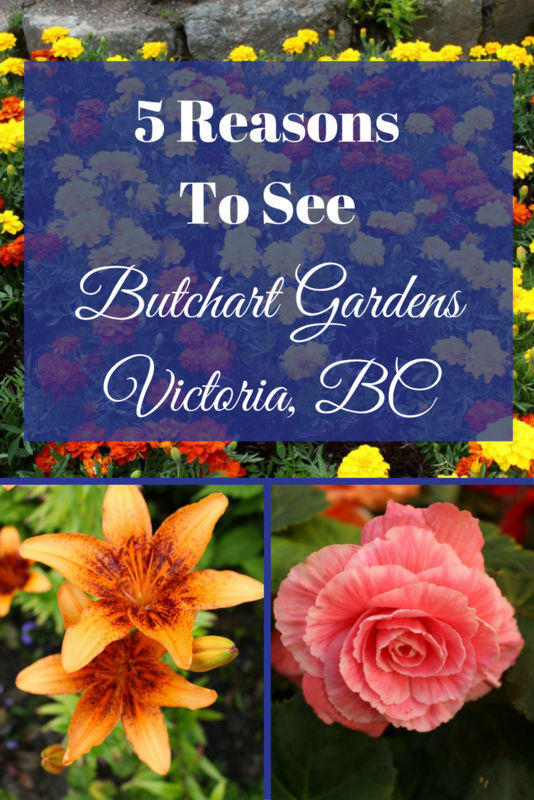 At Butchart Gardens, You Get To See 7 Gardens in 1! The gardens are a skillful mixture of rare and exotic shrubs, trees and flowers, many of which were collected by the Butcharts during their world travels. Over the years, the 55 -acre Butchart Gardens have continually expanded to become 7 different gardens with plants from countries around the world. 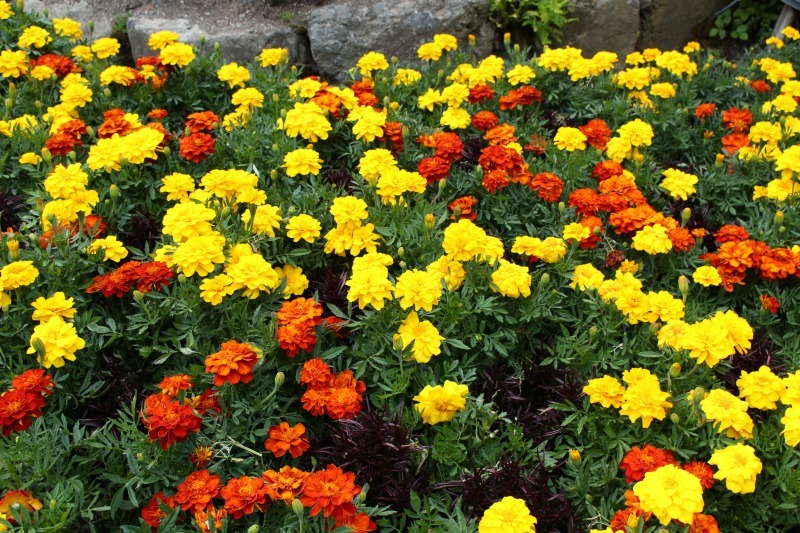 Visit Butchart Gardens to enjoy all the plants, flowers and so much more! Way to state the obvious, duh? Like I said before, I thought going to Butchart Gardens would be like visiting any other garden. It’s not. Spend time here walking along the paths of perennials, trees, and shrubs. See ponds, fountains, Quarry Lake and the Rose Carousel. 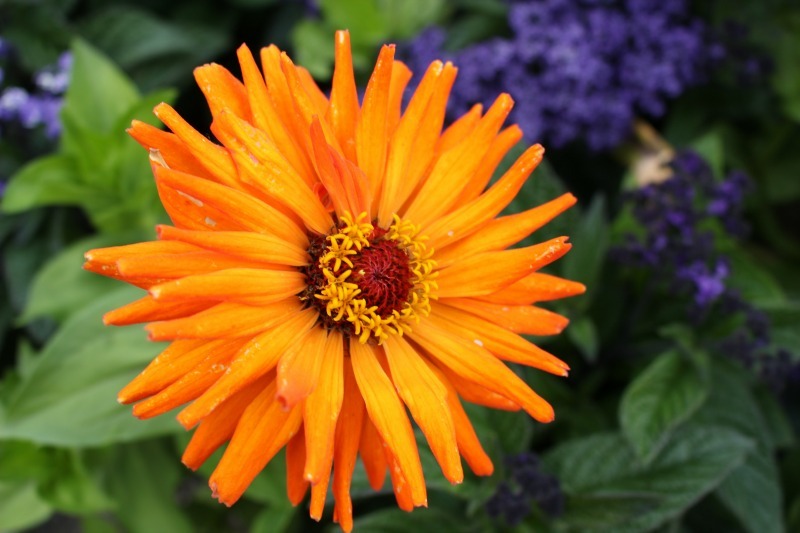 There are so many varieties of plants, trees, flowers and shrubs, you will see many that you have never seen before. More than just an afterthought, as are so many tourist attraction gift shops, this expansive gift shop features hand packaged seeds, souvenirs and handmade gifts from local artisans. While strolling through the Gardens, there are a number of places that require walking up and down stairs. If stairs are an obstacle, there are routes you can take to avoid stairs and still see the gardens. These routes are well-marked. Butchart Gardens has 3 restaurants. The Dining Room Restaurant for Tea and Fine Dining. The Blue Poppy Restaurant, a moderately priced cafeteria. The Coffee Shop with sandwiches, pastries, ice-cream and coffee. Hours for all three vary by season. Since we were visiting in the evening, we planned to have dinner at the Gardens. By the time we were ready to eat, the Coffee Shop was the only restaurant that was open. Keep this in mind when you visit. Check to see when the restaurants are open and plan accordingly. I’m so glad that we spent the evening visiting Butchart Gardens on the last night of our Alaskan Cruise. Having the time to enjoy such a peaceful environment filled with beauty was the perfect way to end our vacation. This post first appeared on Sweet Tea and Saving Grace. Don't know what to pack for your Alaskan Cruise? I didn't either and I WAY overpacked! 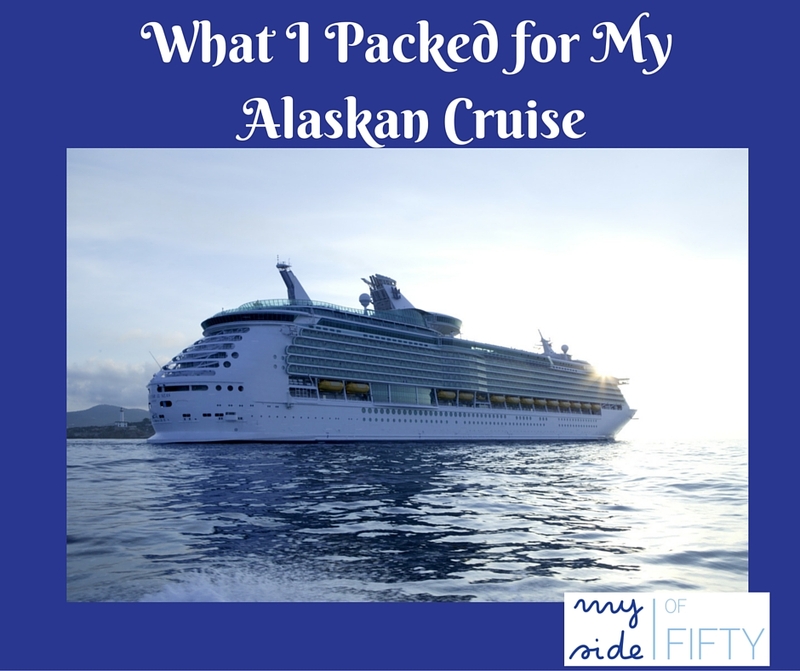 Subscribe to My Side of 50 and get my Ultimate Alaskan Cruise Packing List with all the must-haves PLUS the things you don't need! Subscribe Today! Oh this looks heavenly Cathy so thank you for reviewing your tour and showing us some beautiful flowers. An Alaskan cruise is on our bucket list so I will definitely make a point of taking in these gardens. Thanks! Cathy this is not what I expected when you said Alaska. I guess Alaska is full of surprises! Having said that, I love looking at flowers, any kind at all. And the gardens are a great place for that. You have so many options to choose from. We have a botanical gardens near my home in New York. When the kids were little we’d spend the day there just walking about. Yes, I took the grandkids to our local Botanic Gardens this week. They are lovely. But Butchart Gardens are just grand. No other words to describe them! I would be totally like you at first too, Cathy—especially since I’m not a night owl! But you bring up some great points, and when you’re traveling, I guess it’s good to see as many sights as possible. We only get one life, right? So true. I am a morning person. But I am so glad we went. I took an Alaskan cruise in 1988, didn’t have time to visit, and I have regretted it ever since. I really have to get over the fear of flying I’ve developed since then. Alana, it is such a beautiful place. I am dying to go on an Alaskan cruise and I will one of these days. I pinned this so I could go back and read this and the other posts about your trip. Thanks for telling us all about it. Rena-the Alaskan cruise is a trip of a lifetime. Hope you make it some day! Have been at Butchart. Beautiful place! How beautiful! This is a destination that has Ben on my bucket lists st.
Helene – I hope you make it. Definitely worth the trip! The images are gorgeous Cathy. Thanks for sharing at #OvertheMoon Link Party. I’ve pinned and shared. The gardens look absolutely gorgeous! What a great way to end your cruise! Butchart Gardens is now on my list of must-visit places. Tara – hope you make it there one day – truly gorgeous! I love gardens and these sound incredible. I wish this post was scratch and sniff! I love visiting gardens when we travel. I just love nature. You would love Butchart Gardens, Kellie! 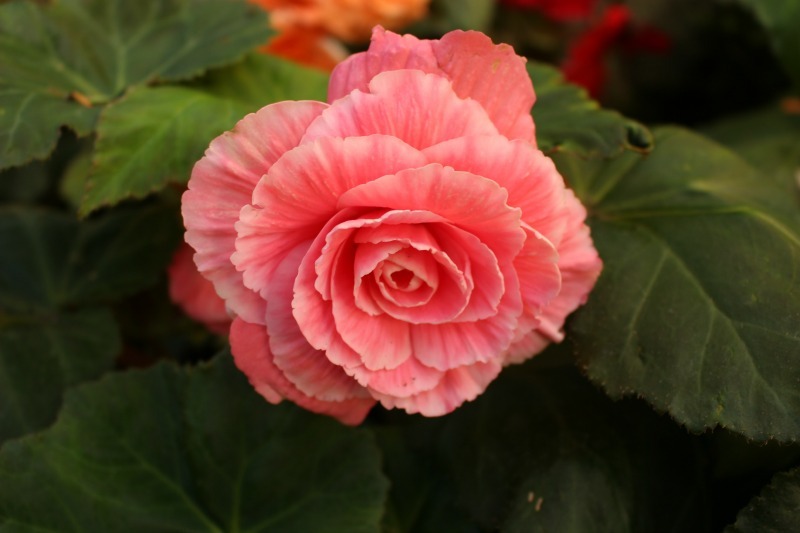 Gina – Butchart Gardens is just your kind of place! Did I tell you I’ve been there? Thank you for bringing your post to the Blogger’s Pit Stop. No you didn’t, but I seem to remember you were on an Alaskan cruise about the same time we were. Such a beautiful place! Sounds like so much fun! 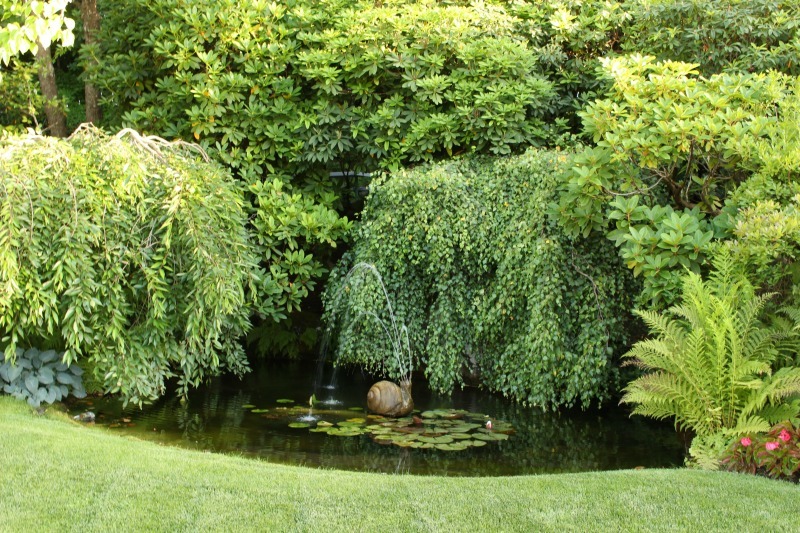 I love walking through gardens and looking at all the pretty flowers and I love any kind of water gardens. Would love to go to Alaska some day. Linda – they had water gardens there too. Beautiful place. 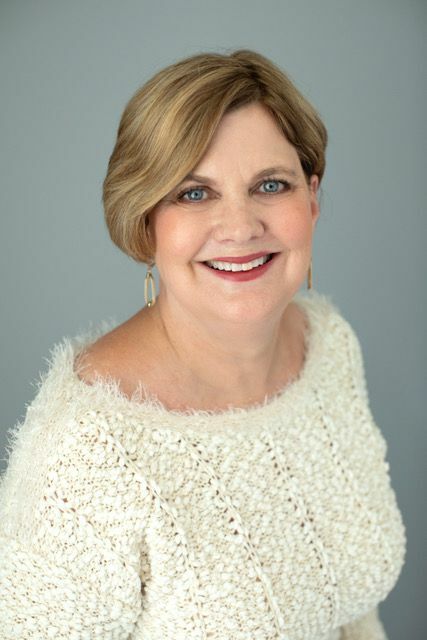 So beautiful Cathy. I would never say no to visiting a garden and this one looks spectacular. All those colors, she must have been one extremely talented lady. Just finished up a cruise and we are looking at some Alaskan itineraries. Sounds like such an amazing adventure. Melissa – we LOVED our Alaskan cruise. Trip of a lifetime! I DID visit Butchart Gardens and they were spectacular. Highly recommended. So glad you were able to visit the stunning Butchart Gardens! I enjoy visiting gardens and this garden is on my bucket list. Thanks for the great photos and review! Yes the gardens are wonderful. Glad you enjoyed it. Victoria is a great place to visit as well! Wow, what beautiful gardens. I must put this on my list to see. Hi, Cathy – Thank you for this brilliant post and gorgeous photos. I am embarrassed to say that I actually live on Vancouver Island, have been to Victoria numerous times (one of my sons lives there) and I have NEVER visited Butchart Gardens (shhhh, please don’t tell anyone)! I have now put in on the top of my list for 2018! Looks like a super wonderful place to visit. Thanks for sharing.